50. Julie Powell- The blog that spawned a movie. And turned on a few more million to the great Julia Child. I can hardly believe that we are on our very last lady on "the list" today! What began a year ago with the venerable Julia Child has circled right back around and ended with a woman who was inspired to learn to cook by cooking the recipes of that #1 lady on our list. Julie Powell was born and raised in Texas. She graduated from Amherst College in 1995 with a double major in theater and creative writing. She and her husband-to-be Eric then embarked on a "seven-year foray into New York City's dizzying wealthy of temp jobs". Boredom and desperation in her these jobs was basically what led Powell to start her year-long blogging endeavor, The Julie/Julia Project in 2002. She decided she was going to learn to cook by using Julia Child's Mastering the Art of French Cooking. She would divide up the recipes and make it through the whole book in a year. She would then blog about the recipes. The popularity of her blog led to a book deal and the release of Julie and Julia: 365 Days, 524 Recipes, 1 Tiny Apartment Kitchen in 2005. The paperback edition was retitled Julie and Julia: My Year of Cooking Dangerously. Unfortunately (I think) neither Julia or her editor Judith Jones (#8 on our list) was very fond of Julie's "project". Jones made the remark that Powell was "not a serious cook". To that, Powell has agreed. She says that what she was doing was creating a creative outlet for herself. This outlet helped her to find her voice...her subject...her tone...which she feels gets a little lost in the movie since it centers so much on the food and cooking. This project was about her finding her vocation as a writer. And while someday she may be a serious cook, what she prefers to be known as is a serious writer. Also, you have to remember that the film is just an adaptation of her book. She says the main character "...just is not me. You have to go into it thinking, this is a Nora Ephron movie -- not my book. Then you can enjoy it." Powell's sophomore effort, Cleaving was released in 2009. Cleaving talks about her six-month stint at Fleischer's, a butcher shop in upstate New York. It also talks about a "crisis point" (infidelity) in her marriage and how Butchery was her way of exploring and working through her problems and her pain. It received many negative reviews and comments, calling Powell selfish and pitiful. Of course, many felt that way after reading her story through her words instead of through the creative lense of Nora Ephron. Whatever your opinion of Powell may be, she was one of the pioneers in the field of food blogging...whether she meant to be or not...and for that, I understand her place on "the list". She is who she is. In honor of our final woman game-changer, I decided to make a simple roast chicken with potatoes and veggies that is similar to the one made at the end of Cleaving called "Home at Last" Chicken. Powell returns home to her husband after her butchering stint. Wine is poured. Movies are watched. 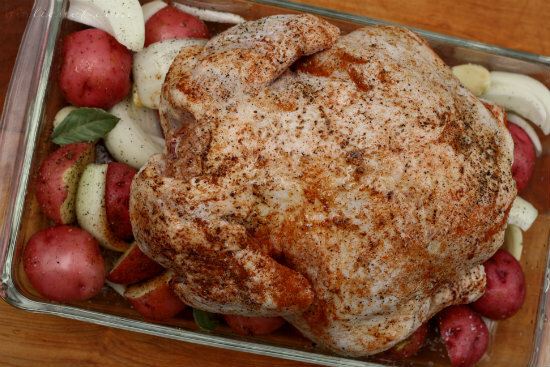 And one of the ultimate comfort foods (in my opinion) scents the air -- roast chicken. Cut any larger baby potatoes in half. 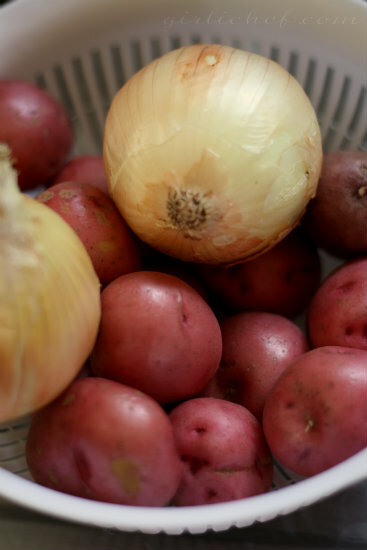 Place potatoes, onion wedges, and garlic cloves in a baking dish/roasting pan. Drizzle with olive oil and sprinkle with salt and pepper. Add bay leaves. Toss everything around to coat. Rub some more olive oil all over the chicken skin and put a bit inside. Season liberally inside and out with salt, pepper, and hot paprika. Stuff the lemon halves inside the chicken. Set chicken on top of the veggies in the pan, breast side down. Slide into preheated oven and roast for ~15 minutes per pound. Halfway through roasting time, flip bird breast side up and move the veggies around a bit. Remove when cooked through and divide up the veggies and chicken pieces amongst serving plates. I really, really hope that you enjoyed this past year and these mini-studies into these 50 fascinating women. Please join me/us for one more week (next Friday) for a wrap-up post. We are home at last Heather and have each come full circle in this challenge. We have learned a great deal over the past year! It's been a great list and this is a fabulous bird! This is a perfect dish for Home, Sweet, Home. And a beautiful way to wrap-up (semi wrap-up) the series. I love your assessment of Powell on this list - more than some of the other bloggers on the list - she did seem to start a movement. Ahhhh, what is it about chicken roasting in the oven that epitomizes home? I love the fact that Julie Powell used her writing to change her life. She hated her job, detested her apartment and used her blog and her cooking to find and share her self and focus on the things that did give her pleasure. Isn't that what we all with our blogs? great post! those roasted veggies look just scrumptious! thanks for sharing! I used to semi-follow Julie's blog. What strikes me is how very primitive blogging was back then! BEautiful post! I'm wondering why Judith Jones, of whom I think a great deal, would say that Powell wasn't a "serious" cook. Does a not serious cook do what Julie Powell did? Someone who is kind of a lightweight cook throws boneless chicken breasts in a skillet rather often, makes chocolate chip cookies off the recipe on the package, maybe stirs up a tuna casserole with potato chips on top. I didn't care a lot for the book (loved the movie), but wouldn't say she wasn't serious in that little kitchen of hers. I consider myself a serious cook, and am wondering if, in Jones' mind, serious equates with professional. Would a fly-by-night cook learn to butcher? Just wonderin'. Anyone else? Hope you'll join the next group sometime after a break. I'm putting my blog on vacation, too. This list of women has been so diverse, from trained chefs to home cooks, each having influenced the food world in all different ways. Although not a real cook, I think Julie is a home cook that got more people into the kitchen cooking and helped take some of the intimidation out of Julia Child's cookbooks. It is such a fitting dish to prepare ... a comfort food that satisfies every time! I have so enjoyed reading your posts Heather! You have approached each week with such creativity! 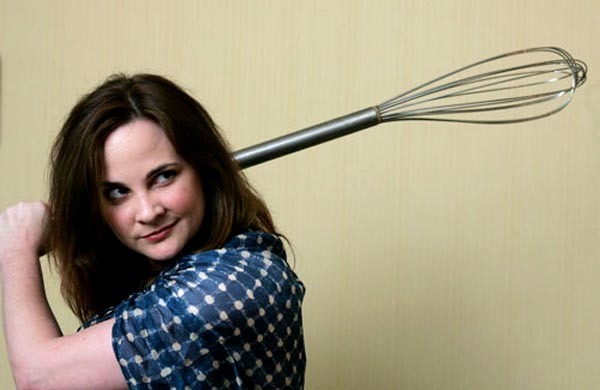 As for Julie Powell, I think she grabbed a tiger by the tail when she took on Julia Child. She was bound to ruffle the feathers of some folk. She did what she did ... and did it well. In the process, she inspired many to give serious cooking a try ... and look where the industry is today ! Nice and informative post about Juiie. Your roasted potatoes look great! Sad to see the group ending, but I'll see you next week for the final cap. Heather, Such a lovely post! 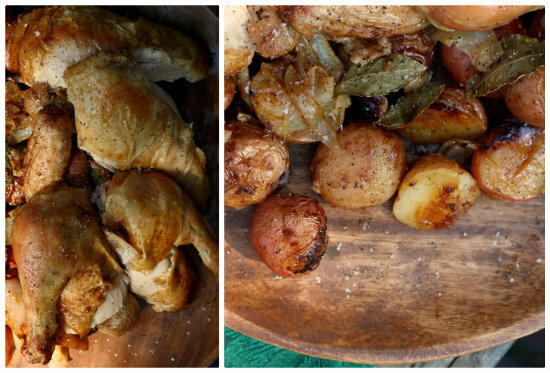 Roast chicken is certainly my idea of comfort food…so satisfying and always delicious! Love those roasted potatoes! It’s been great getting to know you through your blog! The journey has been such fun! It's crazy how time flies! And it's so fitting that powell is the last on the list. Beautiful roast chicken! Such a classic dish. It has been a pleasure having you along for this wonderful ride. I to picked Roast Chicken to feature. Smart minds think alike. Peace be with you. This has been such a great series of posts. I am amazed that you've done 50 already! A great series... Be proud of your accomplishment to see it through. AS to Julie. Hionestly, before the hype of the movie release, i had not considered food blogging so i owe a lot to her. BUT, I sure do wish she had picked a different second project. All that good will, all the publicity, seems like she could have created a brand instead of a painful to read memoir and limiting her future. But... she didn;t ask for my advice. i make myself available and no one ever calls. INMO of course! ha ha ha ha...I hear ya there! I am too. There was a time when the end seemed so far away...and now it seems like we just began! Thanks Susan! Yes, I think you have to accept her for who she is (as everybody) and admire her for going head-first for her dream! That makes me wonder, as well, Alyce. Too bad, really. But it seems Julie didn't take offense and it helped her get where she needed to be, so I suppose all's well that ends well?? I don't know, but it's so true, isn't it. It's all polished and packaged these days! not that I'm complaining... And yes, I think you have to get pleasure (or whatever you're looking for) out of blogging. Otherwise, why bother!? Yes, that's true. I don't necessarily "like" everybody on the list, but I see now how they all had their own impact in certain areas. ...not a Nora Ephron fan!? Powell definitely pioneered food blogging and I hate the belief that you have to be professionally trained to deserve respect in a field. Thanks for sharing the story and recipe on foodie friday. 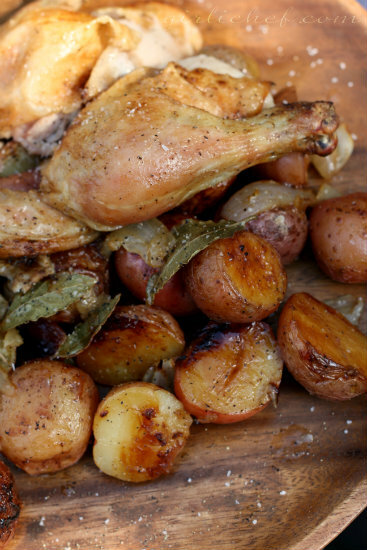 I completely agree that roast chicken is one of the ultimate comfort foods!